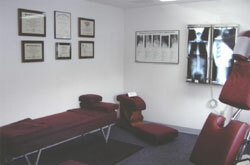 How can you get a subluxation? - Physical: car accident, fall, lifting injury, poor posture, workstation position, sitting improperly, tumbles and falls as well as the first subluxation...being born! - Chemical: poor nutrition, drug use (prescription included), hormonal problems, alcohol, cigarettes, etc. Click to see what scoliosis looks like! If you have undergone traditional medical treatment for various conditions and are still suffering, you may obtain results from Chiropractic Care. "I don't know what happened, I just bent over." "I was just blow drying my hair." "I was just tying my shoe." "I fell asleep on the couch." Do these sound familiar? Often, an old injury provides a subluxation that goes unnoticed (sometimes for years) and then your body can compensate for it no longer. Regular Chiropractic Care can help to prevent this buildup. Children should be checked early. Often a scoliosis can be corrected and/or contained, which will help their health into adulthood. A maintenance program is the best way to stay on top of your condition and assure optimal health! How Often Do I Need Chiropractic Treatment? New patients may initially be scheduled two to three times per week. The frequency of treatment is reduced when the patient's condition improves and stabilizes. People with difficult or chronic cases should commit to a minimum of four to six weeks of treatment before concluding whether it is beneficial to their particular case. Milder cases often respond in less time. 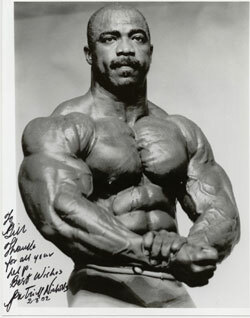 Body builder Patrick Nichols is treated occasionally by Dr. Harris.